Posted on June 26, 2013 by Susan H.
Andy was away on his annual fishing trip with ‘the boys’ Father’s Day weekend so our Father’s Day celebration was detained a week. Andy’s sister hosted a Father’s Day Family Barbecue this past Sunday, inviting their parents, her three children, their ‘friends’ and our family…for a total of 12. –Pork Ribs baked in the oven then barbecued…I brought a mustard free barbecue sauce for Michael’s ribs. 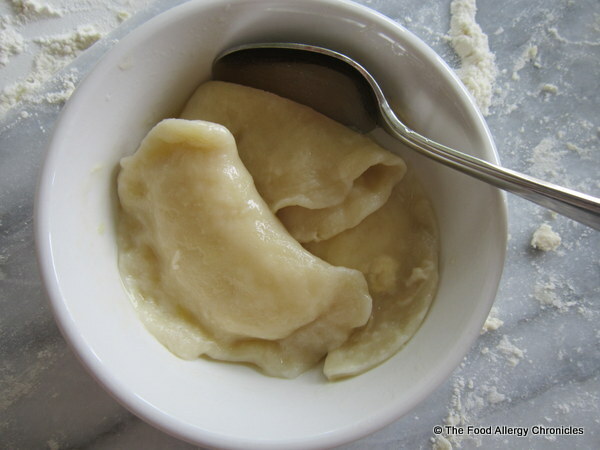 –Pierogis…I brought Dairy and Egg Free Pierogis for Michael as her Pierogis contain dairy and eggs…click here for the post. -Andy’s mom baked a Blueberry and Strawberry Rhubarb Pie…as her pastry contains egg…Michael chose Dairy, Egg, Soy and Peanut/Tree Nut Free Vanilla Cupcakes with Dairy Free Vanilla Icing. -I also brought Dairy, Egg, Soy and Peanut/Tree Nut Free French Stick for all to enjoy. -missing is my Bodum Bistro Sauce Pot for transporting Michael’s mustard free barbecue sauce. I like it because the lid holds a silicone brush which goes right back into the container so there is less risk of cross-contamination by putting it down somewhere. 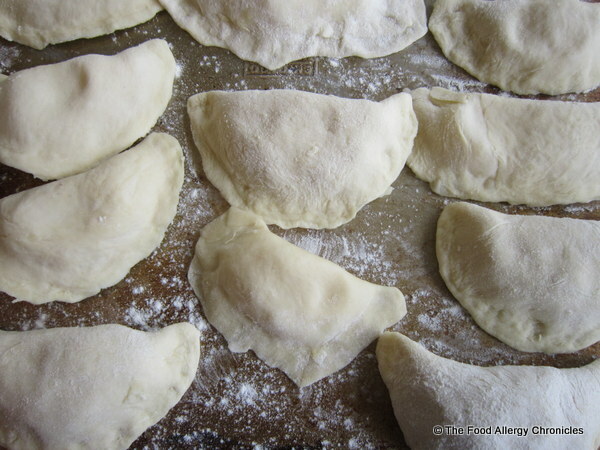 The boys have been at me to make their favourite Dairy and Egg Free Pierogis for some time now…I thought this would be the perfect time for them to learn how to make them. Michael peeled and boiled the potatoes. Refrigerated potato water for pierogi dough the next day. Michael mashed the potatoes and added the Daiya Cheddar Style Shreds, Earth Balance Vegan Buttery Sticks and pepper to create the filling. Covered and refrigerated potato filling for the next day. I heated the reserved potato water while the boys measured the ingredients for the pierogi dough. After the dough had time to rest for 30 minutes…the boys started to roll out pieces of dough to fill with the potato filling. Pierogis were frozen on cookie sheets and transferred into freezer bags…setting aside enough to be boiled up for dinner. Michael ended up taking control of the pierogi making after his father showed him how he remembered watching his father make pierogis…rolling out the dough and cutting out circles. 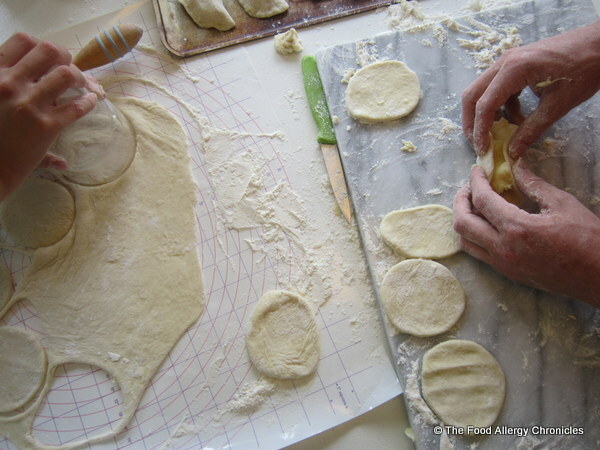 Matthew didn’t like getting his hands all floury so Michael convinced him to be in charge of rolling out the dough and cutting the circles while Michael filled and sealed the pierogis. 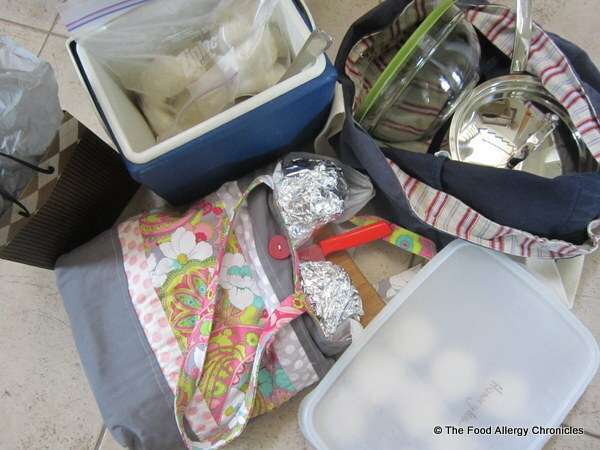 Learning how to cook/bake in general, let alone with food allergies is a life skill…basic cooking skills seem to be getting lost in this ‘fast food’ world. I aim to take a stab at sharing the basic cooking skills my mother taught me with my boys…expanding upon them with the basic allergy cooking skills that I have learned along the way. 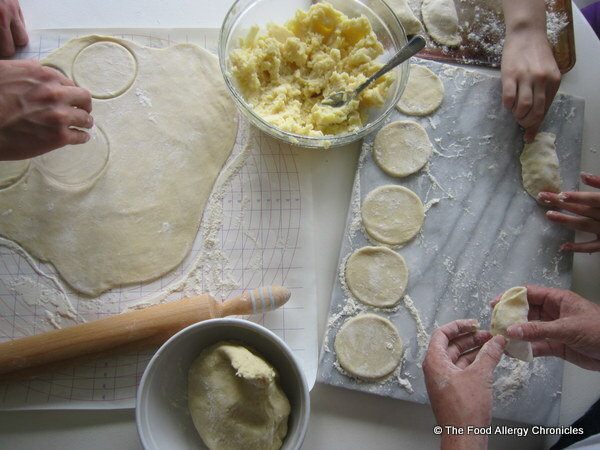 My starting point…teaching my boys how to make some of their favourite allergy friendly dishes. P.S. Michael shared some of his Dairy and Egg Free Pierogis at the family dinner…all were impressed. Even Grandpa…’King of the Pierogis’…was curious to know what was in the potato filling and how we could make the dough without any egg! Are allergic youth learning to cook for themselves at home or are they relying on parents or ‘processed allergy friendly food’? Are allergic youth interested in learning basic allergy cooking skills? Would they sign up for a course if it were offered? This entry was posted in allergies, Attending A Family Dinner Party With Food Allergies, baking, breads, dairy free, daiya, dessert, dinner, egg free, multiple food allergies, mustard free, peanut/tree nut free, soy free and tagged Attending a family dinner party with food allergies, Dairy and Egg Free Pierogis, Daiya Cheddar Style Shreds, Earth Balance Vegan Buttery Sticks, teaching my boys how to cook with food allergies, Teaching my boys how to make Dairy and Egg Free Pierogis by Susan H.. Bookmark the permalink. What a great story! That’s so fantastic that the boys can now make pierogis….what a feat! Thanks for including them. Teens are more open minded when learning from someone other than their own parents and together with their peers. We are taking baby steps with preparing food independently. Notice I said food-and not meals!